Mangoes are so symbolic of Indian summers with the blooming mango tree filled with the aroma of mango and the mellifluous sounds of the cuckoo.I would always ask my mother if the cuckoo /koel never tires of singing and she would say the mango has it so intoxicated- the koel is supposed to peck at unripe green mangoes and their mouths go sore from the acid of the green fruit . In Andhra Pradesh a mango has a great place of importance and no meal is complete without a platter of mangoes served. We would always begin the mango season with a sort of reverence before consuming the first mango of the season baskets full of mangoes are distributed to the poor as charity in memory and on behalf of dead elders. Right from desserts, curries, pickles and condiments like amchur mango has a place of pride. 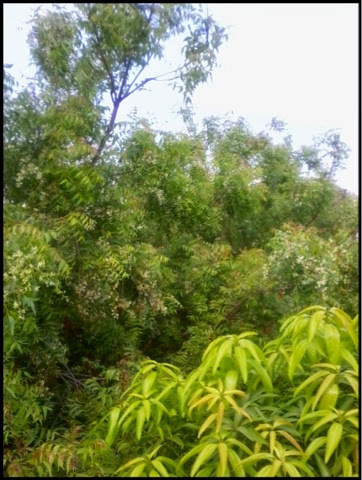 I am full of memories, of spending hours under the mango tree laden with blossoms smelling the leaves and frantically chasing the sound of the koel. 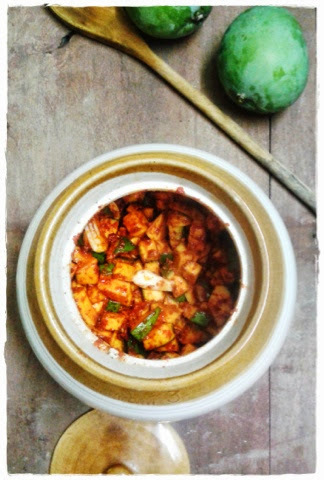 The most important dish at home made from the unripe green mango is kairi dal and today I give you the recipe of this great dish that goes so well with steamed rice potato or green plantain fry and or Hyderabad fried mutton (tala hua goshth). 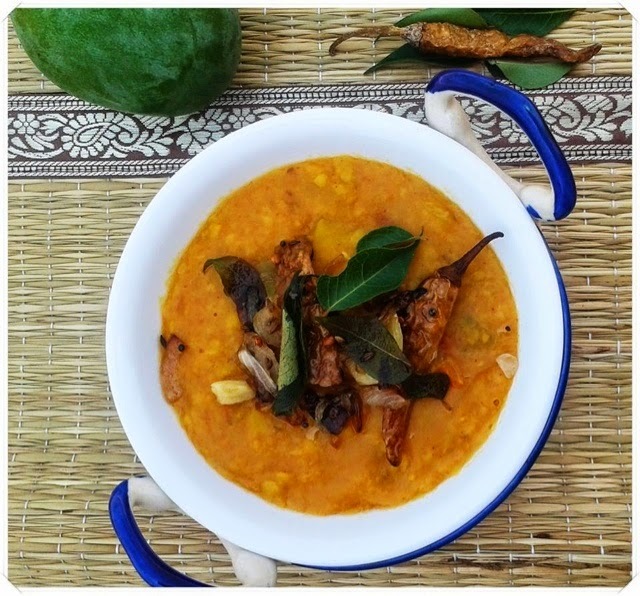 My grandma always made this tangy dish on an earthen stove lit with firewood and she would insist on using dried twigs of the mango as it would impart a great flavor and this is how it was in olden times when preparing savory and tangy dishes like Dalcha,bagarey baingan or tamatar ka kut (tomato pulusu)thewood from tamarind or mango would be used to enhance the flavor. Andhra so watch out for this on my blog.A big shout out to Richa Bhargava and Inspiration for joining as latest follower members of the foodgoddessonline blog family. Thank you! manner along side fried potatoes and fried mutton or chicken. It is delicious. delicious and I can never have enough of them.8f you don't have them on hand use the dried red chillies. My nani( grandma ) used to make one of the best mango pickle in summer in the Andhra manner and there were three different recipes avakai(mango pickle) sweet mango pickle( theepurgai/ kairi ka meetha achaar) and a shredded mango pickle( tharshi) it was such a joy to watch the basket loads of collector mango arrive at our place and all the women folk pitching in to slice the pieces sometimes neighbors helped and it all attained an atmosphere of joy and festivity. As children our chores were to stand guard while the pickle dried in the sun and not let the birds come anywhere close to the drying mango pieces placed over clean cotton sheets out on charpai/ coir cots and occasionally end up eating the pieces. When the pickles were stored in the store room after finishing the pickling process in huge earthen jars wrapped up in flimsy colorful gauge it was a picture to behold. The pickles would then be distributed to family members and neighbors.It was a huge task that had so many people involved and thus become memorable as the pickle would last for the whole year almost until the next mango season.Pickle making came to a halt after my nani passed away but my mother's younger sister has managed to learn the recipes and make it,she usually sends my mother a jar of pickle every year. My friend Priya who lives in a beautiful villa in chennai and is enthusiastic about cooking had tried her hand at a batch of pickle making this summer and this way she got to use the very organic produce from her garden Mango Tree which gave her a bumper produce. 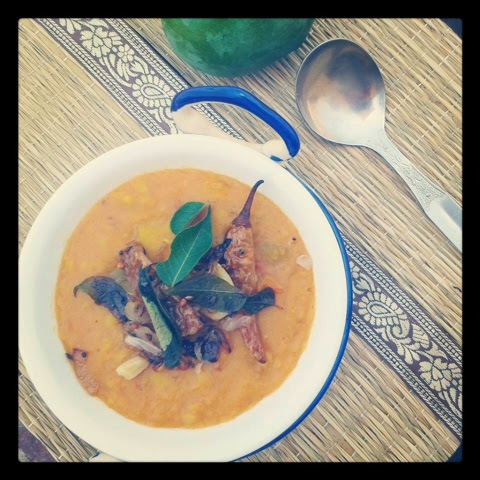 She was kind enough to share images of the tree, her version of the mango pickle which is known in Andhra as mukkala pachchcadi and she went ahead and tried out my recipe of kairi dal and also sent me the images of the dal. Use a clean bone-dry ceramic or glass jar. Wash the mangoes and pat them dry with a clean dry towel and cut them into small pieces and spread them out for about half an hour. Slice the garlic big. Roast lightly the fenugreek seeds and mustard seeds separately and cool them. Powder them together in a blender jar. Heat the oil also slightly and allow it to cool. Put the mango pieces into the bone dry jar along with the garlic. Add the chilli powder, fenugreek-mustard powder, salt. Toss about until well coated with spices. Add the oil and mix well. Close with a lid and let it rest for a day. Stir the contents the next day with a clean spoon and you may find the oil floating on top and let it rest another day. stir the contents again the following day and its ready for use. It gets better and better as it marinates and steeps in the spices and oil. Serve best with cool curd rice or like me, mix it in some steaming cooked rice with a little ghee and Enjoy. Keeps well for about a month if handled with care. I usually put it into the refrigerator after a week as added precaution. Note: Yellow mustard tukda can also be added but its completely optional. Always use clean and dry spoons and ladles.